As the final session in our Biology unit (which also included Skeletons, Classification and Habitats), we looked at the 5 Senses. The big question we were exploring was: How do your senses help you experience and understand the world around you? My Five Senses by Aliki. Probably the best overall intro to the topic, so good for opening circle (for broad range from 2.5 – 7 years old). It introduces all five senses, then gives examples for each: “When I drink my milk and eat my food, I use my sense of taste. I am tasting.” It’s not an exciting story, but it is a friendly and welcoming book full of simple illustrations of familiar experiences. Let’s Play a Five Senses Guessing Game . Good at engaging the kids, and it ends with asking “what senses do we use when we eat popcorn?” which ties into an easy snack. For the book corner, choose one of the many book series that have one book per sense. 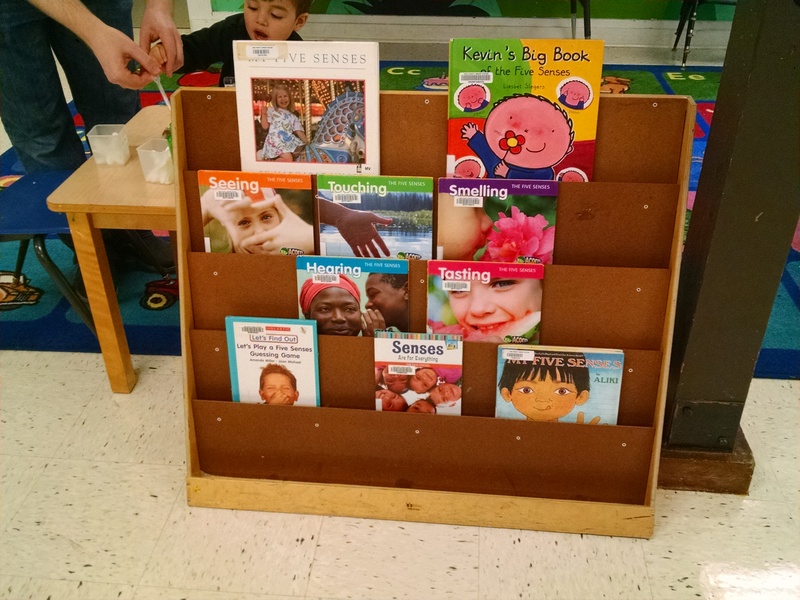 We used the Five Senses series by Rissman. It’s for preschool and kindergarten age, with nice photos,simple explanations, and clear examples. Another bonus is that the people depicted are very ethnically diverse. They also talk about how our senses protect us and about unsafe smells/tastes, etc. How many senses are there? One of the great things about teaching and working with children is that it encourages us as adults to look at things with new perspectives. As we describe how something works, we gain a deeper understanding of it ourselves. And sometimes we learn new things. I surprised some parents this week by talking about the flavor umami. Many had never heard of it. With other parents, I surprised them by sharing that there are more than 5 senses. There are things which we perceive/are aware of that we can’t really describe as coming to us through those previously defined 5 senses. Vestibular system – helps us to stay balanced, and also tells us if we are moving slowly or quickly through space. Although other senses inform this (like if we’re standing on our head, touch sensors in our scalp will help confirm that) this perception is separate from the five senses. Proprioception – how we know where our body parts are located in space without having to look at them. (This is important… Think how hard it would be to drive safely if instead of watching the road, we had to look to make sure our foot was on the gas, and look at the position of our hands on the steering wheel.) A 3-month-old baby has to look at his hand when reaching for something so that his eyesight can help confirm the location. A five-month-old can reach out and grab without looking at her hand. Senses of our internal bodily systems – the sense of being hungry or full, itches, and the need to urinate are not explained by the five senses and instead indicate other ways in which we perceive information. There’s LOTS more in this Wikipedia article.